People are hungry for immediate answers. 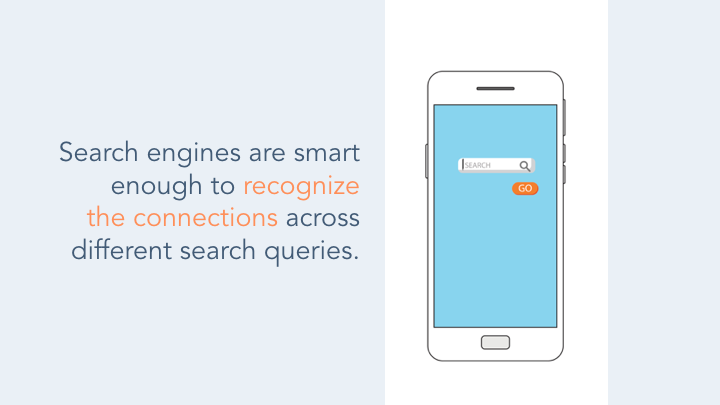 Luckily, it has never been easier to find the information you’re seeking via search. A lot of marketers want to know: how does HubSpot optimize for search? I talked to our blogging team to find out, and put together a series of insider tips we’re eager to share with you. Check out the tactics below, and start maximizing organic traffic to your own blog. Search algorithms are ever-evolving, and in 2018 they are as smart as ever. Search engines are now capable of recognizing connections across search queries. This has big implications for marketers. Gone are the days when the searcher typed in simple keywords. Searches today are complex, putting the heavy lifting back on Google and other search engines to connect the dots. 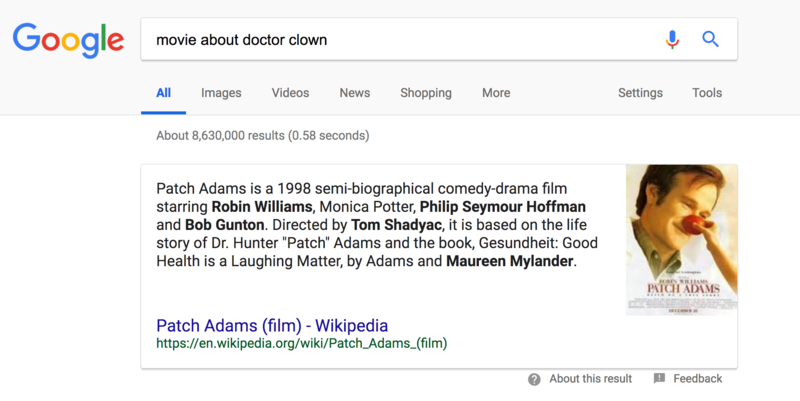 For example, if you type “movie about doctor clown” into Google the first result will be the movie Patch Adams, despite the fact that there is no overlap in the search terminology. The takeaway: search engines are incredibly intuitive. Google recognizes exactly what the searcher wants without the searcher explicitly stating their question. Go ahead, try it for yourself! At HubSpot, our blogging team realized this shifting behavior, so they altered our blog strategy to focus on topic clusters, instead of specific keywords. To do this, they first identified what topics to prioritize. They then aligned our existing blog posts into the aforementioned clusters and generated tons of new content under those clusters. Finally, they built internal and external links at every available opportunity, creating connection points between content that share the same topic cluster. In doing so, we signal to search engines exactly how the pieces fit together. While it can be time-consuming to reorganize your content, the payoff is huge. Let’s use the example of Patch Adams once more. If you type “movie about doctor clown” into Google, you will see a small box with a short answer summarizing the premise of the film right below the search bar. There’s no need to click into a link to see the answer; instead, Google makes it easy to get the information on first glance. This answer box is a featured snippet. And if you’re not using your blog to optimize for featured snippets, start now. Here’s the incentive: Google pulls the featured snippet from one of the pages that ranks on page one of the search results, but the featured snippet does not necessarily need to exist in the #1 link. This is a huge opportunity to get content that is not in the #1 spot to actually appear above the #1 spot. Want to see a live example? Search “Let’s get meta” into Google, and see for yourself. To identify which content is good for featured snippets, Google frequently serves up answers for “Who, What, When, Where, Why and How” queries. If you think your content is addressing one of the aforementioned questions, prioritize writing a golden-nugget answer, and you may just see your content sitting right below the search bar. Another key reason to prioritize for the featured snippet is voice search. As voice search is on trend to become 50% of all mobile searches by 2020 — a prediction by both Google and Bing — featured snippets are now being tapped as the trigger response by virtual assistants. So, as search evolves, so should you. There are a number of benefits to creating new content like having additional pages to be indexed by search engines, providing education to your curious users, and it is a good way to stay relevant in your industry. However, as any tenured blogger knows, new posts can take a while to build up steam. In fact, it is often slightly older posts that generate a large portion of traffic because they have had time to develop authority. One of the most effective strategies HubSpot’s blogging team implements to boost SEO was is to historically optimize our old posts. Historical optimization is the process of taking old posts and making them new again with higher-quality, refreshed content, keywords, and links. By leveraging your already existing search authority on these posts, search engines will reward your freshness, which will then lead to a surge of new visits to your content. Do You Know How Search Engines Determine Rank? We surveyed 295 individuals across the United States, asking the question “Do you know how search engines, like Google, rank the results you get after a search?” An astounding 48% of people answered “no.” As a marketer, you do not want to be in that 48%. If you do not evolve with SEO, you risk losing key business opportunities to maximize your brand awareness and generate leads. It is time to understand, strategize, and capitalize on invaluable SEO tactics — like blogging — that will propel your business into success in 2018 and beyond.